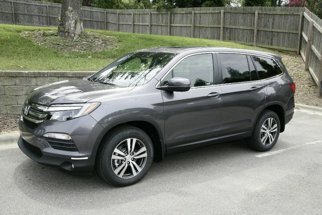 Find this 2018 Honda Pilot Touring at Vann York Automall located in High Point, NC. Proudly serving the greater Winston Salem, Greensboro, Kernersville, NC area since 1971, for your next new car see what Vann York Automall can do for you! Want more room? Want more style? This Honda Pilot is the vehicle for you. You deserve a vehicle designed for higher expectations. This Honda Pilot delivers with a luxurious, well-appointed interior and world-class engineering. The look is unmistakably Honda, the smooth contours and cutting-edge technology of this Honda Pilot Touring will definitely turn heads. Based on the superb condition of this vehicle, along with the options and color, this Honda Pilot Touring is sure to sell fast.